Everyone listen up. Are you sitting down? Cool. Daniel Radcliffe is coming back to Broadway! Yes! 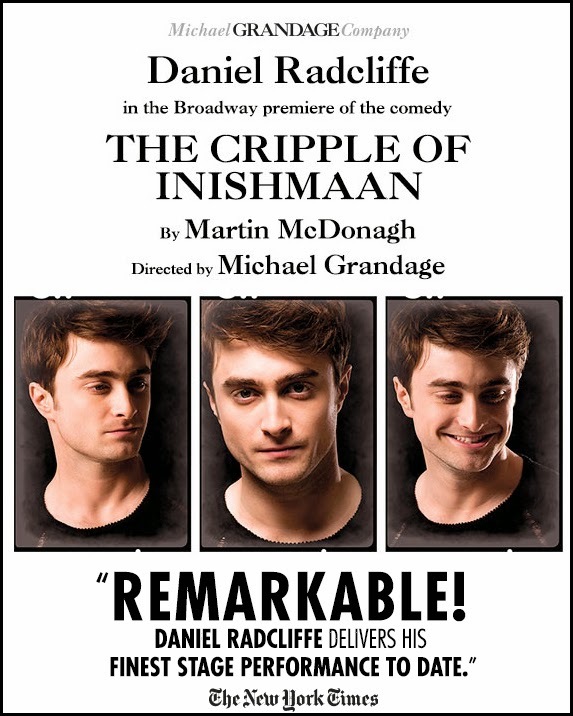 The Harry Potter star will be making his 3rd appearance on the Broadway stage (first 2 being Equus and How to Succeed In Business Without Really Trying) in Martin McDonagh's dark, dramedy THE CRIPPLE OF INISHMAAN. Set on the remote island of Inishmaan off the west coast of Ireland, word arrives that a Hollywood film is being made on the neighboring island of Inishmore. The one person who wants to be in the film more than anybody is young Cripple Billy (Radcliffe), if only to break away from the bitter tedium of his daily life. McDonagh’s comic masterpiece examines an ordinary coming-of-age in extraordinary circumstances and confirms his position as one of the most original Irish voices to emerge in the second half of the twentieth century. Previews begin Saturday, April 12. Opening Night is Sunday, April 20. I love Daniel Radcliffe because he has really worked hard to develop his career and diversify his roles. he deserves all the success and warm wishes he receives!